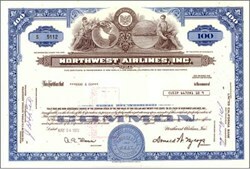 Beautifully engraved certificate from the Northwest Airlines, Inc. issued in 1972. This historic document was printed by the Security-Columbian Banknote Company and has an ornate border around it with a vignette of two allegorical men sitting by the company logo, a plane, and a globe. This item has the printed signatures of the Company�s President (Donald W. Nyrop) and Secretary and is over 36 years old. Delta Air Lines Inc and Northwest Airlines announced late Wednesday that the two airlines have officially merged. Earlier in the day, the U.S. Department of Justice approved Delta�s plans to merge with Northwest Airlines. The combined airline will be based in Atlanta and retain the Delta name. Delta (NYSE: DAL) and Northwest announced plans to merge in April. The deal creates the world�s largest airline. The new Delta has about 75,000 worldwide employees. As approved by both companies� stockholders earlier this year, Northwest stockholders will receive 1.25 Delta shares for each Northwest share they own. Based on Delta�s closing stock price Wednesday, this exchange ratio is the equivalent of $9.99 per Northwest common share. From its hubs in Atlanta, Cincinnati, Detroit, Memphis, Minneapolis-St. Paul, New York-JFK, Salt Lake City and Tokyo-Narita, Delta and its Northwest subsidiary offer service to more than 375 destinations worldwide in 66 countries and serve more than 170 million passengers each year. Donald W. Nyrop began his aviation career in 1939 when, as a young attorney, he joined the general counsel's office of the Civil Aeronautics Authority. After serving in the Army Air Forces during World War II, he joined the Air Transport Association, where he planned overseas routes for U. S. airlines. He re-entered government service in 1948 as assistant to the CAA. In 1954, he was invited to assume the presidency of Northwest Airlines, and in the following quarter-century led the airline to unprecedented heights of profitability and safety. 1926 - Northwest Airways takes to the sky, carrying air mail from the Twin Cities to Chicago with a "fleet" of two rented, open-cockpit biplanes-a Thomas Morse Scout and a Curtiss Oriole. 1938 - Northwest develops the first practical aviation oxygen mask, making possible high-altitude flying over the Rocky Mountains. 1948 - The "Red Tail" is painted on all Northwest aircraft for the first time, creating a trademark that becomes known world-wide and that continues in use almost 50 years later. 1955 - Northwest voluntarily becomes the first airline to operate without government subsidy on Trans-Pacific and United States-Alaska routes. 1960 - Northwest begins "fastest U.S. jet service to Asia" with Douglas DC8 aircraft, the airline's first "pure jet." 1971 - Northwest is honored for noise abatement leadership by National Organization to Ensure a Sound-Controlled Environment. 1976 - Northwest is the first airline approved by FAA to install coordinated flight crew training. 1988 - Northwest bans smoking on all North American flights, the first major U.S. airline to do so. 1991 - Northwest and KLM Royal Dutch Airlines launch their first joint service, twice-weekly flights between Minneapolis/St. Paul and Amsterdam.